Rules: Draw a loop in the grid by travelling horizontally and vertically without touching itself. The numbers in the grid indicate the number of cells occupied by the loop in the 8 neighbouring cells. Background: I saw this puzzle for the first time in Dragan Tolomanoski‘s Zagorje Open part. Probably this puzzle idea belongs to him. 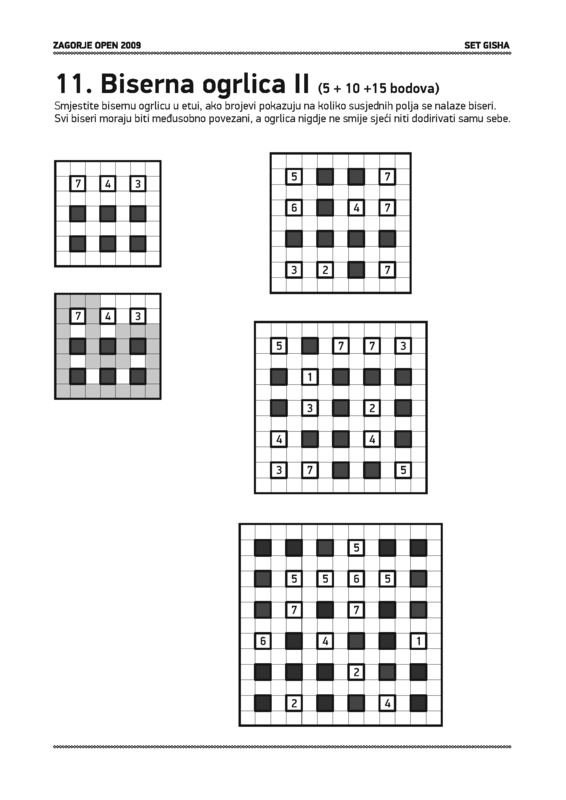 We have published some of his Zagorje Open puzzles in Akil Oyunlari magazine in the past. One of them was Bosnian Road. 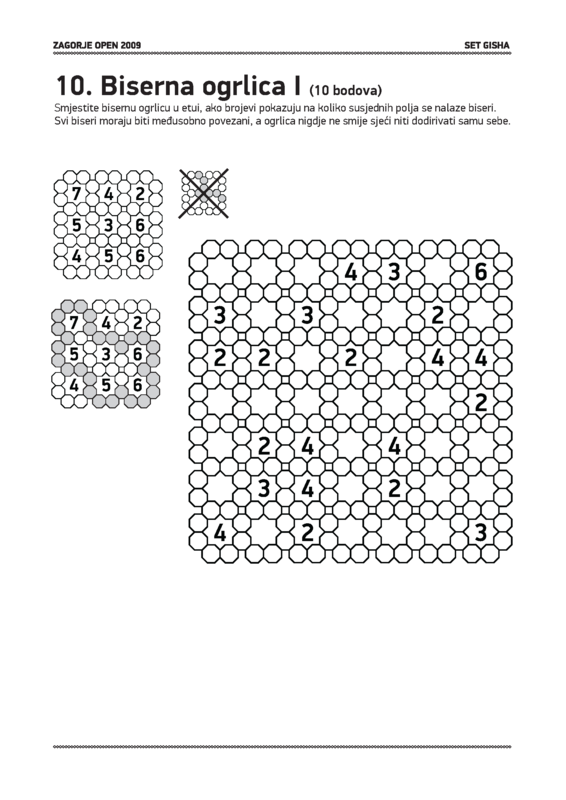 Original puzzle name in Bosnian is “Biserna Ogrlica”. It means “Pearl Necklace”. You can see the cover page of ZO by Gisha. As you see, the part contains two Biserna Ogrlica puzzle types. First one was designed using octagonal cells, the second is formed of square cells. Biserna Ogrlica I was published in Akil Oyunlari magazine, issue 67. Biserna Ogrlica II was published in issue 74. 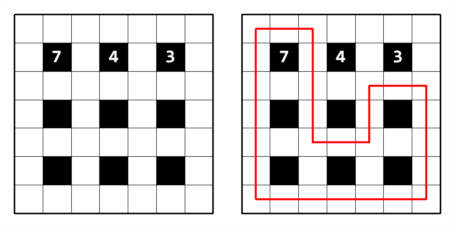 When we were preparing the online index of issue 74, we used the name “Looper” for this puzzle. But actually there already existed a puzzle by Cihan Altay. So I changed the name later. Dragan is from Bosnia, and I love Bosnia. So “Bosnian Road” seemed better to me, we used the same name in Turkish school competitions as “Bosna Yolu”. Murat Can Tonta made so many this type for Akil Oyunlari school competitions. And he made for Akil Oyunlari magazine also, issue 78. After Murat, Prasanna prepared for his blog, you can see Prasanna’s Bosnian Road puzzles. This comes from Bram, very nice construction with only 4. Finally, it appeared a loop puzzle type in last WPC, Kraljevica. It’s name is Looking for the Loop [see:Dalmacija Open 2012 puzzle]. Bu yazı Instructions içinde yayınlandı ve Akil Oyunlari, biserna ogrlica, bosnia, Loop, puzzle olarak etiketlendi. Kalıcı bağlantıyı yer imlerinize ekleyin. I guess my blog’s Bosnian Road link covers this, but if you’re mentioning tournaments, it was used for Hungarian Championship and the Indian set in 24 HPC of 2012 (I haven’t categorized this into individual puzzle types! I should, and hopefully will soon) too I guess. 😉 I solved your recent one btw, and really enjoyed it. In the WPC puzzle, Looking For The Loop, the rules allow the loop to touch itself, and so it is different from Bosnian Road.